We begin our 1998 Coffee of the Month series with the perenial favorite, Tanzania Peaberry. There are two good reasons for this: First, it will provide a fine comparison with our delicious December COM, Congo Kivu. Produced at the same altitude and latitude and under similar climatic and cultural conditions, the two provide us with a practical test of any “peaberry effect”. Tropical climate, mineral-rich volcanic soils, average altitude of more than 4,000’, and 40 to 60 inches of rainfall per year, with adequate distribution throughout the growing season. The landscape is open wooded savanna, upon which several species of coffee grow wild (although the cultivated species are introduced). The high growing altitude is crucial, as the coolness and thinner atmosphere retard the plant’s maturation, giving the time needed to develop complex taste character. As the quote from Ukers suggests, Tanzanian coffee benefits from a long tradition of quality production.The rich wild character of premium Tanzanian coffee is amply evident in this month’s example. Produced by the “washed” method, Tanzanian coffee is superbly prepared, clean tasting, brightly acidic, fruity, with lingering wine-like overtones in the cup. We take it a shade darker than our typical roasting, to compliment the fresh aromas which gives this coffee its fruity bouquet. 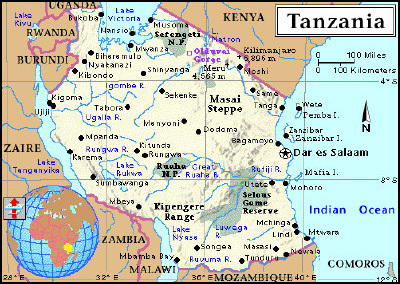 The American coffee authors Charles and Violet Schafer call Tanzania peaberry, “the most aromatic coffee we have ever had”. We invite you to join us once again in savoring the undiminished quality tradition of Tanzanian Peaberry.